I'm pretty sure Bella has the same extensions to the main chassis Brad. It also seems to be shown in the 1977-78 manual cut away. I just looked at the rear of Peanut's frame. It's similar in construction but different in some aspects. The hitch frame on mine was fabricated out of 2"x5" tubing. The hitch frame on Peanut was fabricated from custom bent 2"x5" channel. At least that saved Peanut from rusting away like mine did. Also the GM frame on Peanut is one piece where mine has a 10" section of U channel welded onto the end of the truck chassis. 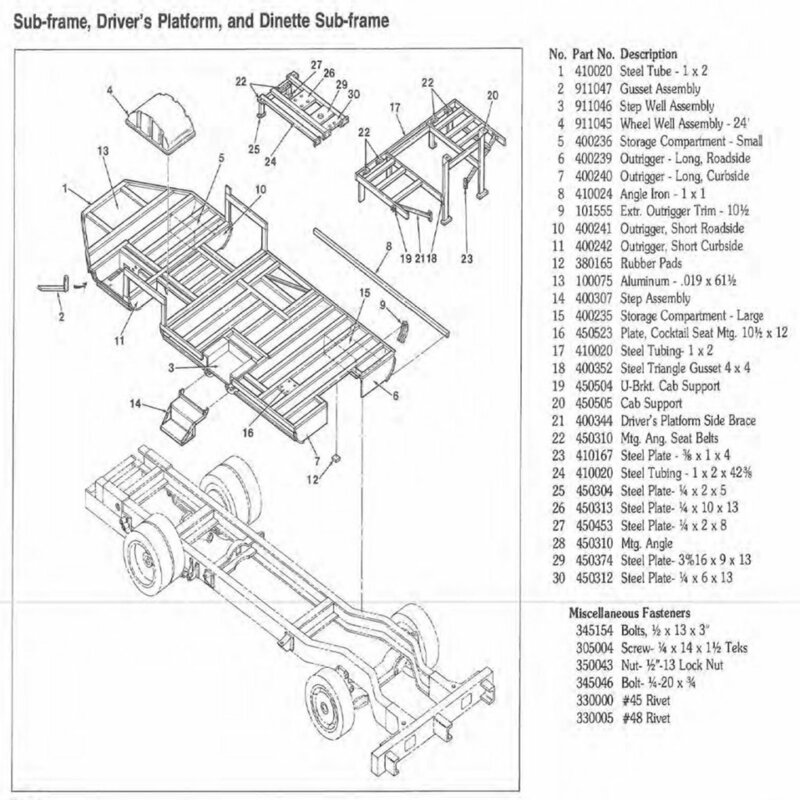 You can see in the picture there is no seam in the truck chassis frame. After thinking about hitches for a while I think I've decided not to build the same type of hitch receiver arrangement that mine came with. I think I'll either build or buy something similar to this Reese Multi-Fit Receiver. I think this style of receiver would be a reasonable way to fit a new receiver to Peanut. Some of the propane system piping would have to be tweaked a little and there might need to be some rework on the holding tank drain piping but I think it would be doable and plenty strong for towing. I think you have the right idea Brad. Unless you how some special circumstance that forces you to custom fabricate something the pre-manufactured hitch should be faster and easier. I have started out building something like a simple hitch and 10 hours later thought , why am I doing this? Sometimes simple things get involved fast. You certainly have other tasks to challenge yourself with. Yeah, it's easy to get caught up in the idea that "I can build it cheaper than what I can buy it for"
Been there, done that way to many times! I'd like to buy a hitch that is a straight bolt on for the frame width instead of an one size fits all but it seems hitches are listed by vehicle make/model rather than size. No one lists a hitch for a P30 chassis so I'll likely have to call and ask for measurements before I buy one. If need be I'll buy one of the one size fits all and live with it. Nice getting a piece of cancerous rusty metal like that removed. I would think a well fitting prefabed hitch setup would be the way to go if it doesn't reduce your clearance at the back. There is one added mid frame between the wheels, and a couple at the rear. Can't really place Jack much behind the rear axels with out tweaking the shell when the extensions flex. Flexie flyers. They are. Clearance issues is one of the reasons I'm hoping to find dimensions of a hitch before I buy it. It will probably take a few calls to the manufacturer to find out for sure. Actually I've seen the frame extensions on a 345, I dismantled one for scrap 3 or 4 years ago. Definitely an interesting way to manufacture something! So I've opted to install the generator on a sliding drawer similar to how I did my old 310 generator. The early front bath Argosy has the generator compartment in the rear. Instead of orienting the generator side ways as is typically done Airstream inserted the generator length wise in the compartment. I had originally planned on using an Onan 4.0 but found that it was to large for the compartment. As it turns out the Onan 6.5 from the 345 is physically smaller than the 4.0. The last two days were spent fabricating brackets, etc. for the tray slides. The hard work is pretty much done, now I just need to drill a lot more holes for various bolts and cut a piece of metal here and there and then take it all back apart so I can paint everything. Anyway, here's some pictures of what it looks like at the moment. Looking pretty good sir. Those drawers can support the weight of the generator easily? They look pretty beefy. Big improvement on the original Brad! Curious, when the generator is on the slide, do you disconnect the exhaust and electrical feed when sliding it out for maintenance? I suppose you could use a plug of some sort for the electric. As you know, on my 310, I cant access anything on the back of the generator as it is. I was surprised I could even change out the points. Great work Brad, you must be getting pretty good at this mod! The drawer slides are rated at 500 lbs for stationary equipment and 300 lbs for mobile equipment. The Onan 6.5 weighs in around 260 or so. When the drawer is in the "in" position I will be clamping it in place so the slides won't have to deal with road impacts or the suspension trying to bounce it around. I think the slides cost around $150 for the pair. They are considered full extension slides but even when fully extended the generator will still have about 2" inside the compartment. Considering the location and the orientation of the generator it still won't be the easiest to work on but it will be a darn sight better than if it was welded in place! Yes, the exhaust pipe does get disconnected. Fortunately this generator doesn't use exhaust pipe clamps to connect the exhaust pipe to the generator manifold. It uses a flange at the exit of the exhaust manifold. You just have to bolt the external exhaust pipe to the flange. Much easier than trying to pry apart two pipes that have been clamped together. I will be using two pairs of male/female 30 amp connectors to connect the generator to the coach. Basically to slide the generator out the exhaust pipe has to be disconnected and that's it. The two electrical connectors only need to be unplugged if you're removing the generator from the drawer. One thing I was faced with was having to fabricate a bottom plate for the drawer I was making. after thinking about it for a while I decided to go the cheap route and cut the bottom out of the original generator tray I salvaged from the 345. A 4-1/2" cutoff wheel on a little hand grinder made fast work of it. All that's left to finish up the siding tray installation is to drill 6 more holes, finish welding four brackets together and then paint everything.